Heat the oven to 400°. Season the orange-roughy fillets with 1/4 teaspoon of salt and 1/8 teaspoon of pepper. Put the fish fillets in a glass or stainless-steel baking dish and add the wine and the 1/4 cup oil to the dish. Bake the fish until just done, about 12 minutes for 3/4-inch-thick fillets. Meanwhile, in a small frying pan, toast the bread crumbs over low heat, stirring, until they"re light brown and fragrant, about 4 minutes. Stir in the garlic, lemon zest, and parsley and cook 1 minute longer. Remove from the heat and stir in 1/8 teaspoon each salt and pepper and the remaining 2 tablespoons oil. Transfer the fish to plates. Sprinkle with the bread crumbs and spoon the pan juices around the fish. Fish Alternatives Any mild white-fleshed fish will work equally well here. Try flounder, sole, pike, or catfish fillets. 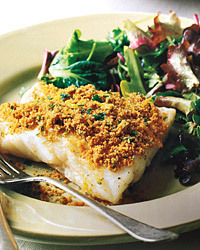 Variation Orange Roughy with Orange Gremolada Bread Crumbs: Substitute the grated zest of 1/2 orange for the lemon zest in the bread-crumb mixture. One of the new, clean-as-a-whistle white wines from Spain or the south of France will pair nicely with the Mediterranean flavors of garlic and olive oil. Look for the Spanish Albariño or a Côtes de Gascogne from France.